By the end of last week, I craved quiet time, so I passed up a night out on Friday to settle in at the dining room table Friday night. It was a definite mental health booster to create something over the weekend. The feel of a warm, soft quilt was soothing as I let it run through my hands again and again, machine quilting it. And my thirst for good words was satisfied too as I was listening to the audio version of Before Green Gables, the prequel to Anne of Green Gables. Get your hands on the book even if you are a grown-up Anne of Green Gables fan; the author exquisitely reproduces Lucy Maud Montgomery’s writing style to pull it off. Anyway, back to the quilt reveal. 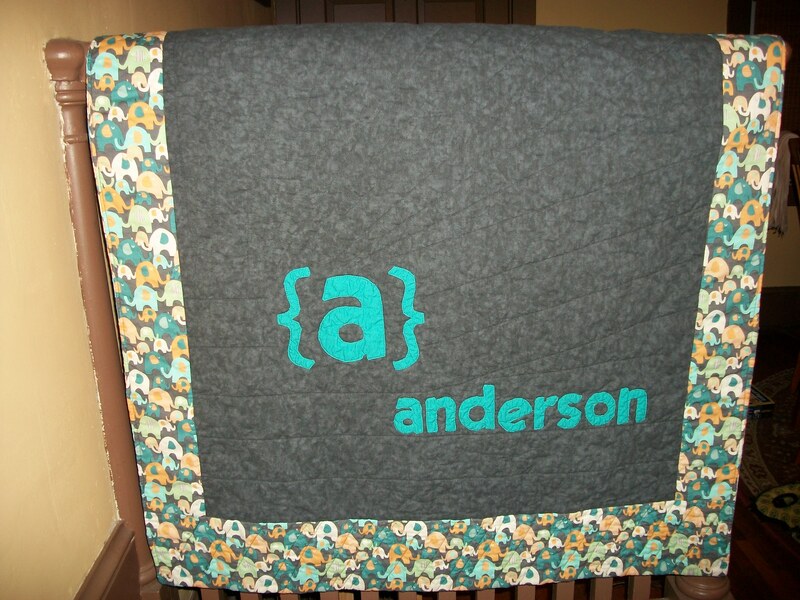 It was inspired by this modern monogrammed quilt. I didn’t follow the tutorial measurements exactly, but I liked this simple design to showcase an elephant print that caught my eye during one of my meandering trips to Joanne Fabrics. Plus, I thought the design was a good fit for my friend Becca, who loves to knit and lives in an old, restored log cabin built in the 1800s but who also enjoys a modern tinge to life and home. The project started with some hand applique. 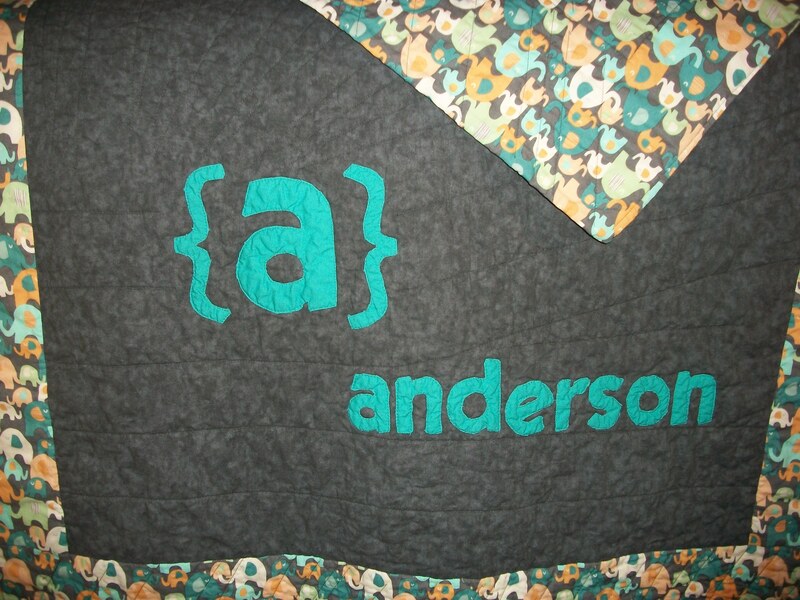 I knew from working on little Adam’s quilt that I am not good enough with my machine yet to applique with it. A kindred spirit (can you sense the Green Gables influence?) quilter at work reminded me of the freezer paper technique for hand applique, but I wasn’t sure how to pull the freezer paper out from inside some of the letters after they were sewed down. I found this helpful tutorial that showed me how to put the freezer paper on the outside of the letters. I think if I were doing simple shapes, I’d rather have the freezer paper inside to give me an edge to snuggle the fabric up to while stitching, but for this project, the technique was helpful. 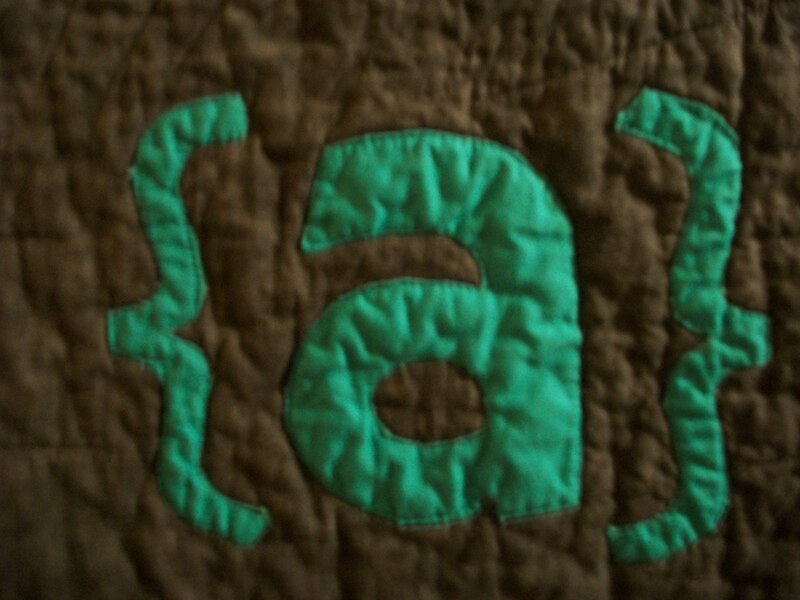 I machine quilted right along the inside edge of the letters with coordinating thread to try to secure any areas where my applique stitching had weaknesses. If you look closely at some of the wild quilting lines, you’ll be able to see why I’m not in control of my machine enough to machine applique just yet. I’ll get there. 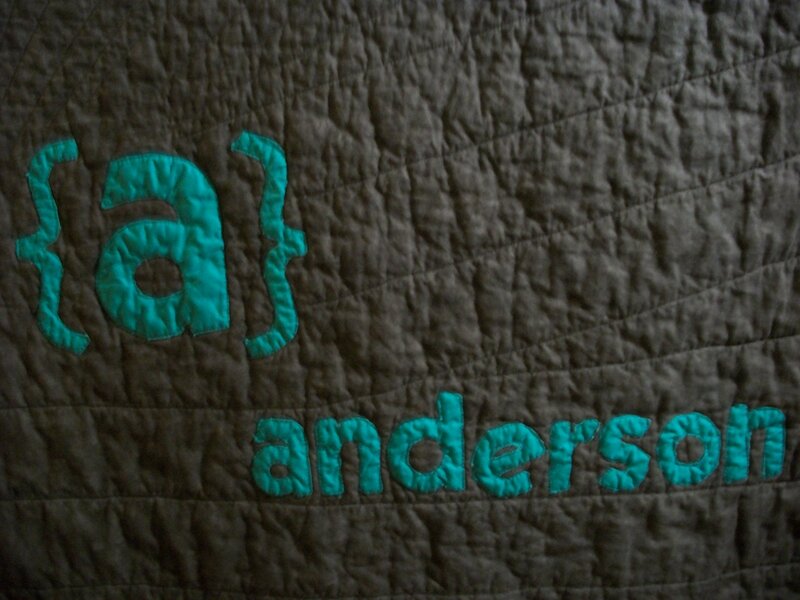 Here’s the full monogram, and this shows my quilting pattern. Since I wanted a modern look, I kept it very simple. I sewed a few straight lines across the bottom of the quilt around the monogram, and then I took my quilting ruler and just eyeballed roughly diagonal stripes around the rest of the quilt. I didn’t worry about spacing them exactly even. Here’s the quilt when it was all finished. I wanted simple edges. Originally, the plan was to make the binding out of the elephant fabric until I realized that I would tear my hair out if I tried to get that pattern matched reasonably well. I cringed at the thought of putting on a bias tape that didn’t match the gray. Plus, a bias binding felt more traditional than I wanted to make the quilt. So, pillowcase binding turned out to be the perfect solution. What a simple technique. I’m definitely adding it to my repertoire for the future. I love, love, love how the fabric colors tied together. I owe my mom (not a quilter or sewer by anyone’s stretch of the imagination) a huge shout-out for wandering around Joanne’s with me for a looooong time. And, after all that wandering, I selected two solid colors. Sometimes I just have to rule out the complicated options before landing on something simple. 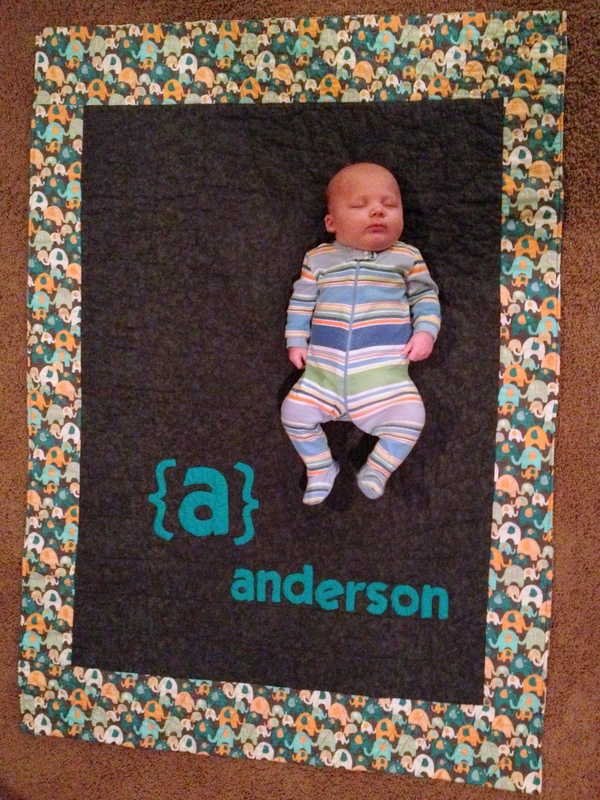 And, here’s Anderson checking out his new quilt. I thought it was pretty great of him to be wearing a coordinating sleeper when I arrived with his present. Such a cutie, and he’s growing so fast. He’ll outgrow the quilt before I have time to blink twice. This entry was posted in quilting, what I'm reading and tagged quilt, reading. Bookmark the permalink. It looks great. And such a cute picture! Love this! What a great idea. It looks beautiful!